"If you are looking for an ideal side dish for your curry buffet, try this out! Your guests will be impressed! 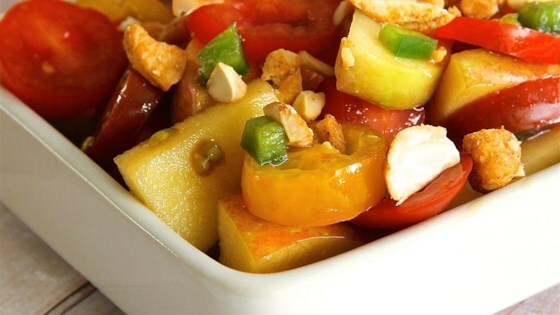 No one can resist this 'Thai' style salad!" In a medium bowl, stir together the chile pepper, salt, sugar, and soy sauce. Squeeze in the juice from the lemon. Add the tomatoes and apple, and toss to coat. Sprinkle the chopped peanuts over the top. Chill until serving. It was OK... not the best thing ever, but my boyfriend and sister seemed to like it all right. Not too exciting... but it wasn't gross, either. Too much liquid, but interesting flavor combination.